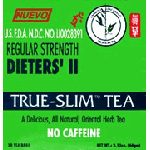 Bamboo Leaf Brand True-Slim Tea is a dieter tea (U.S. F.D.A. N.D.C No. LI0028381). The manufacturer is registered with USA FDA (Registration number 061512). It has been proven an outstanding natural "helper" to reduce weight, reduce bloating, improve metablism, cleanse digestive system, and remove excessive fat deposits from your body. BEFORE USING THE TEA, NOTE THE FOLLOWING: Its normal for some individuals to experience extra bowl movements after using the tea. This is believed to relate to the cleansing of the body's system and should disappear gradually. First time users should restrict themselves to one tea-bag per day after dinner. Not more than two tea-bags per day should be consumed. Bamboo Leaf Brand True-Slim Tea is available in both regular and extra strength formula. Individuals can further dilute the tea to suit their own needs. Bamboo Leaf Brand True-Slim Tea should be strictly avoided by pregnant and nursing mothers, children, elderly and sick peoples. To comply with FDA requirements we do not make any claims to the efficiency of this product.